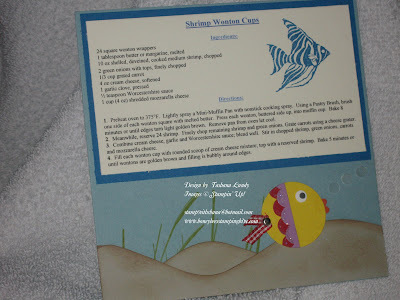 Here is another 6X6 recipe card I made for a SCS swap. The design at the bottom to the card can be found here , at Flowerbug's Inkspot. This is another Pampered Chef recipe. I love PC. I use to be a consultant. I used Baja Breeze, Pacific Point, Creamy Caramel, Yoyo Yellow, Real Red, Lavender Lace, Only Orange, Vellum, Whisper White, Basic Black and Very Vanilla card stock. I stamped images from Ocean Commotion and Inspired by Nature stamp sets. I also used Red Gingham ribbon and a brad. I used various circle punches, scallop edge punch and the Boho Blossom punch along with a tool from the Cutter Kit.